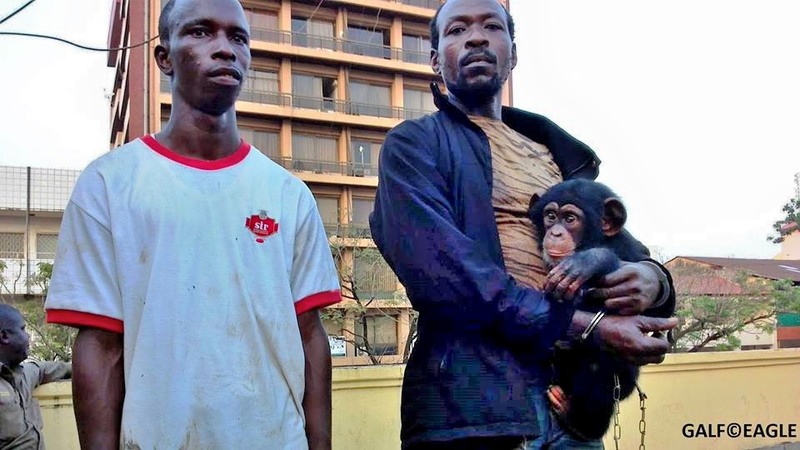 Two traffickers were arrested trying to sell a baby chimpanzee in Conakry, Guinea, but to whom and for what purpose remains a mystery. PEGAS has tried to learn the purpose of the chimpanzee capture from the wild in the Fouta region from the NGO involved, GALF (Guinée Application de la Loi Faunique), but was told only that it was not intended for international trade. Is there demand for baby chimpanzees in Conakry? We would certainly like to know more about that. (Conakry, Dec 20) The fight against commercializing wild animals advances well. The battle to protect animals thought to be potential reservoirs of deadly viruses, started a year ago by the authorities, seems to be gaining momentum in the field. After the Kindia and Labé case, two more presumed chimpanzee traffickers were arrested at Kaporo, in the Ratoma Commune of the Conakry suburbs. During questioning, the accused buyer, Mamadou Moussa Barry, stated that he bought the animal from a friend with the intention of keeping it for himself. However, attracted by the profit that the chimp’s sale could generate, Dinos Doré, who has served for a long time in conservation projects of animal species threatened by extinction, decided to act as a middleman between the owner and an eventual buyer of the merchandise. The two were arrested Friday, December 19 as they tried to sell the animal. They are being held at the central Judiciary Police station for questioning before being transferred to the Dixinn court for arraignment. If convicted, they could face three to six months of imprisonment. The baby chimpanzee has been placed with the Chimpanzee Conservation Centre at Faranah where we’re told he will return to the wild. Guinean law, as well as international conventions that Guinea is party to, classifies the chimpanzee as a totally protected animal species. Detention and commercial trade of such animals without prior authorization from the competent authorities is strictly prohibited. This entry was posted in GALF, Guinea, LAGA, live rescues and tagged GALF, Guinea, LAGA, live rescues. Bookmark the permalink.